Lauren Emberson, Vice-President Student Life and Events for the Ryerson Student Union, has filed an official complaint to harassment officers with the Canadian Federation of Students for how she was treated at the organization’s most recent general meeting. According to her reports, Emberson experienced what she believed to be targeted discrimination and exclusion at the event, and she wasn’t alone in her feelings. Both Tanvir Singh and Jay Reedy, President and VP Student Life of the Kwantlen Student Association respectively, testify that Emberson was treated unfairly, and that they too felt hostility directed towards them from the CFS national executives at the meeting. She says that, until other delegates told her, she wasn’t aware that it is possible to submit an official harassment complaint against people from the Federation. When she filed the report, even after following up with the national executive and chairperson, harassment officers told her that there was nothing that they could do to help. She received a response from the chairperson confirming that the email was received, but so far, no other action has been taken. “Often the people who use harassment to control the spaces are people who have been going to these spaces for 10 years,” she says. According to Emberson and Singh, after an apology for this behaviour was requested at the meeting, one of the accused took the mic to admit that they said what Emberson claimed they had said, but did not apologize. The November CFS annual meeting is the last that Emberson will be able to attend before her term ends. In her incident report, she asked for the issue to be reconciled and for harassment to be taken more seriously at meetings in the future. Singh and Reedy attended the November meeting together and also felt prejudice there. At the opening plenary of the meeting, it was mentioned that a delegate had a severe chocolate allergy, but because Reedy’s CFS-booked flight arrived in Quebec after that announcement was made, he wasn’t aware of the risks. When he started eating M&Ms in a meeting the next day, Singh and Reedy say that the Chair of the CFS responded by telling him to stand and leave. “When you’re at the CFS to affect some sort of positive change it’s very demoralizing,” he says. 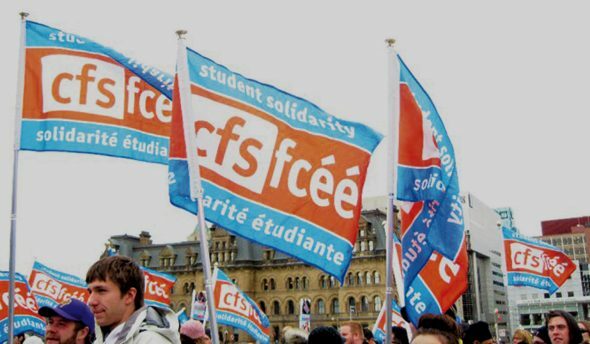 The next CFS general meeting will be taking place in June. Singh hopes that, over the summer, the Federation will discuss issues of harassment at its events. He also wants to send more delegates from the Kwantlen Student Association to the next meeting. The CFS did not respond to interview requests to be included in this article.